Buffalo Chicken Dip Recipe. © 2009 Frank's® RedHot Sauce®, licensed to About.com, Inc. 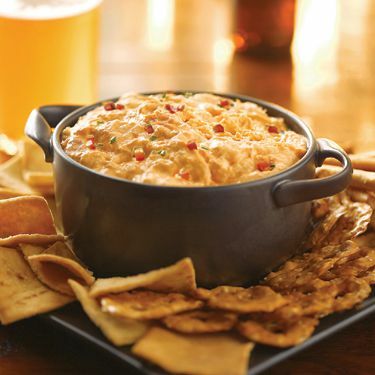 If you love Buffalo wings, this Buffalo chicken dip recipe will probably be just as wonderful. All the flavors from one of America's favorite appetizers come together in a hot dip that takes any event up a notch. Whether you make it for game day or you just want a savory snack, this recipe will probably be a new go-to favorite. Use canned chicken, rotisserie chicken from the deli or your own leftover cooked chicken in the dip. It is then mixed with other ingredients and served hot with celery sticks, crackers, veggies -- or all three. This could not be easier to throw together. You can prepare it using a traditional oven, microwave, slow cooker or tailgating gear. However it works for you, it is bound to delight all who give it a try. Heat the oven to 350 F. Place 8 ounces softened cream cheese into a deep baking dish. Stir until smooth. Mix in 1/2 cup blue cheese or ranch salad dressing, 1/2 cup any flavor Frank's® RedHot Sauce® and 1/2 cup crumbled blue cheese or shredded mozzarella cheese. Stir in the chicken. Bake it for 20 minutes or until the mixture is heated through. Stir and garnish as desired. Microwave Directions: Prepare as above, using a microwave-safe dish. Microwave, uncovered, on high for 5 minutes or until hot, stirring halfway through cooking. Slow Cooker Method: Combine ingredients as directed above. Place mixture into a small slow cooker. Cover pot. Heat on the high setting for 1 1/2 hours until hot and bubbly or on the low setting for 2 1/2 to 3 hours. Stir. Tailgating Tip: Prepare dip ahead and place in a heavy disposable foil pan. Place pan on grill and heat dip until hot and bubbly. The war rages on as to who came up with the original hot wing appetizer, but it is generally believed they were invented in 1964 at the Anchor Bar in Buffalo, N.Y. The most colorful story involves owner Teressa Bellissimo's predicament when her son and his hungry friends ambled into the tavern looking for a late-night snack. What's a mother to do? She fried up unbreaded chicken wings, dipped them in a buttered spicy chile sauce, and served them with celery and blue-cheese-dressing dip to cut the heat. Bingo! Buffalo chicken wings were born and have become a worldwide culinary sensation.